We all know Greece is in a tricky financial spot right now. Pretty much all of Europe is breathing down their neck for cash, no one has any, and it’s a big Greek mess. But, as always, ol’ Torchy has a plan. See, Greece used to build some pretty quirky cars. Quirky cars are becoming rare today. See? 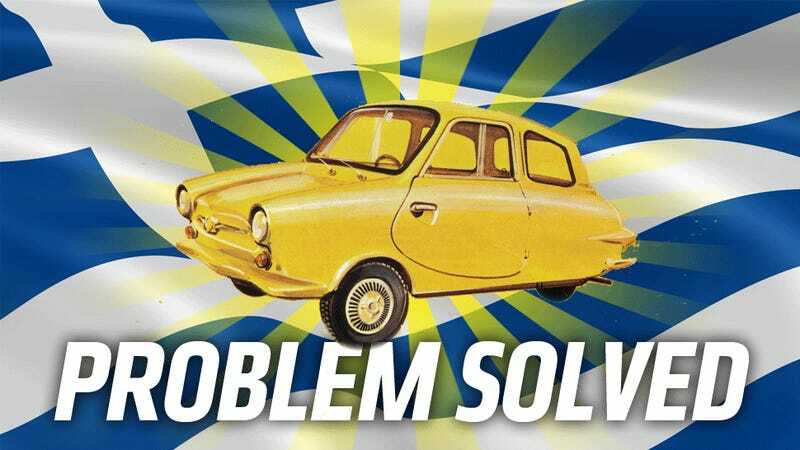 Quirky cars+Greece+TBD=PROFIT. I mean, it’s not rocket science taxes here, people. We all know that building somewhat low-volume, niche-market cars is probably the quickest, best way to financial success. I mean, just look at Fisker or that Elio fellow. They’re raking it in, right? I haven’t checked, but let’s say of course they are. And the good news is, Greece has a pretty fantastic history of making some very interesting, if not exactly successful, cars. There’s pretty minimal automotive production going on today, but back in the ‘60s-’80s Greece had a number of car and truck companies, and they produced things that were quite unique. I think taking a fresh look at some of these cars is a good idea, and perhaps Greece will become the go-to country for cars that fit all those holes in the market that the big companies are too boring and chickenshit to fill. Let’s take a look at some of these amazing Greek cars! Follow me, down to the next paragraph! It already feels like something American, right? The Neorion Chicago was the idea of Greek millionaire Giannis Goulandris who had started a company to build electric cars, but soon found he wanted to build more ‘conventional’ cars. Though, really, his idea wasn’t all that conventional— he wanted to build a luxury sedan that could go off-road. He wanted a sort of ‘30s retro/gangster-chic style (hence the name Chicago), but he wasn’t too happy with the somewhat inelegant end result, which he called a “mountain dinosaur.” I’m not sure that’s an insult, really. The car was built with a steel chassis at the Neorion shipyards, and had an aluminum body. Power came from an AMC V8, and the result was quite off-road capable and comfortable. Only two ended up being made. The Chicago seems like a prime candidate for the American market. It could pick up where the Chrysler 300 left off, plus pull in off-roaders looking for something more upscale, yet sick of Navigators and Escalades and all those tired luxury SUVs. A modern version of this is Euros in the bank, Greece! Okay, so that covers the niche luxury/off-road market well. What about the growing market for efficient city cars? Surely there’s people out there looking for something with a different style than the usual boring players, right? You bet there are, and Greece once had some solid players here. Based on the German Fuldamobil, the Greeks took that very basic three-wheeled microcar and pushed it to its furthest development in the Alta A200. The Alta was wider, roomier more comfortable, and a generally attractive and roomy city car. If the same formula was used today — German mechanical design, Grecian style — say, by taking a Smart/Twingo platform and giving it a somewhat teardrop, more exuberantly styled fiberglass body — there’d have to be some takers. City people want to stand out, too, and a modern Alta could do just that. Plus, if they really wanted to go nuts, a modernized version of the also Fuldamobil-based Cabrioletta, with its open bodywork and surrey top could have a market niche all its own, at least until Honda decides to sell its S660 here. And what about small and practical? The Greeks were masters of that, in the form of the tiny 3-wheeled truck — there were many (Ros, Motoemil, Dinap, etc.) Styl-Kar was even a VW-powered three-wheeled truck that at one time was a very common workhorse in Greece. I say, for this one, keep these (whichever nameplate you decide) three-wheeled to get around the Chicken Tax, and sell tough, cheap trucks in the US to urban delivery and work people. Maybe three-wheeled passenger cars will have trouble taking off in the US, but what about fleet vehicle buyers? The cost savings over regular pick-ups would be huge, and that’s the key factor to many fleet buyers. Or, if we want to stick to four wheels, what about a version of the Farmobil 700? It may be the weirdest thing to wear a BMW roundel (it was powered by a BMW flat-twin motorcycle engine) and it’s sort of like a bigger Honda Vamos — a simple, cab-over utility vehicle that looks both useful and fun. Maybe even not an on-road target, maybe a competitor to stuff from companies like Polaris? I’m trying here! Can your Ferrari climb a pile of rubble? Hell no. Really, the only competition for something like this would be a Rally Fighter — the Korres could go head-to-head with one of those, why not? So, Greece, I hope you were taking notes — this is GOLD. You want out of this mess and finally be able to throw a wad of cash at Germany’s borders and tell them to get bent? This is how. Make some uniquely Greek cars, and sell the crap out of them. It can’t fail, right? Man, it feels good to solve such a huge problem. I’m taking tomorrow off.